Since my big chop, my hair has been growing, but like I mentioned in my hair journey so far, not as fast as I expected it to. And definitely not as fast as I want it to. Some say healthy hair should grow about half an inch every month, if that is the case, then I'm right and though my hair has made good progress, it still has a ways to go. Around the time I started researching better hair products than the one I had been using was when I was contacted by Sunset Hair to try out some of their Exotic Allure products. 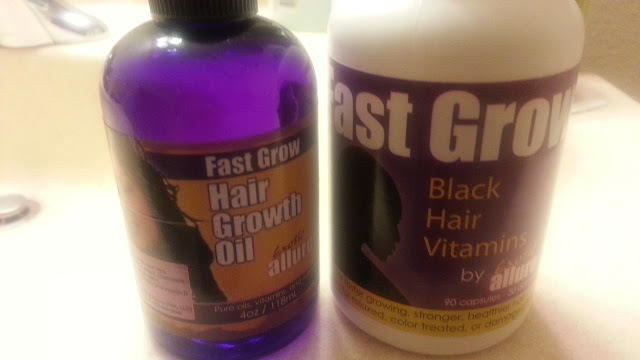 From their website before I accepted to try the products, I found that the Exotic Allure Hair Growth products were specifically formulated to help promote fast, healthy hair growth by reducing hair breakage and shedding. 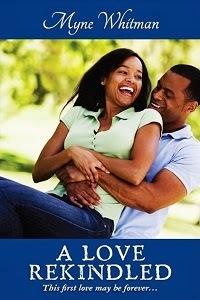 It can be used for both relaxed or natural hair, and can be out on hair when wet and also while dry. For those with dry, flaky, itchy or inflamed Scalp, the oil supposedly helps too. 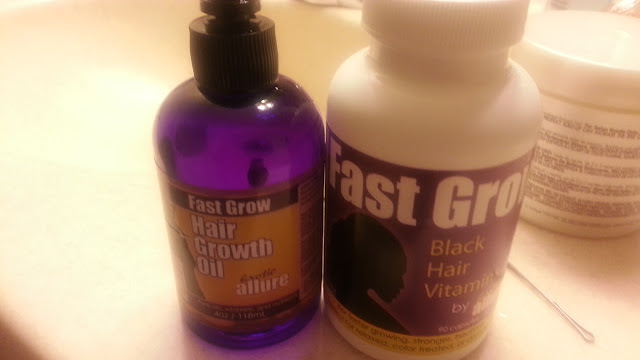 I agreed to do the review and soon received the Fast Hair Grow Oil and Black Hair Vitamin. Being that I was TTC and was already taking many other vitamins and supplements, I was a bit leery of taking even more. When I cross-checked, the components of all these supplements were basically the same, so I decided to use just the oil and that is what I'll be reviewing. - The Hair Growth oil is non-greasy. It appeared to be water based and this meant it was easily absorbed into the hair and scalp. - It kept my hair moist and soft and made it more easily manipulated without tangling or giving me a headache. - It was quite light and did not weigh down my hair. In fact, I noticed that my hair was springier and bouncier and had more shine. - There was less shedding and hair breakage whenever I used this product before combing or putting my hair in a protective style - usually cornrows. - It has a peculiar smell. This is relative since we react to smells differently. Atala compared it to patchouli and said it calmed him. I was OK with the smell, it didn't turn me off, but it could have been better. - Was there significant hair growth? Don't get me wrong, my hair definitely grew, but I don't know if it was just the usual, and if I can attribute it to this product. I am conflicted on this since I only used one bottle which lasted just over a month and did not use the accompanying vitamins. 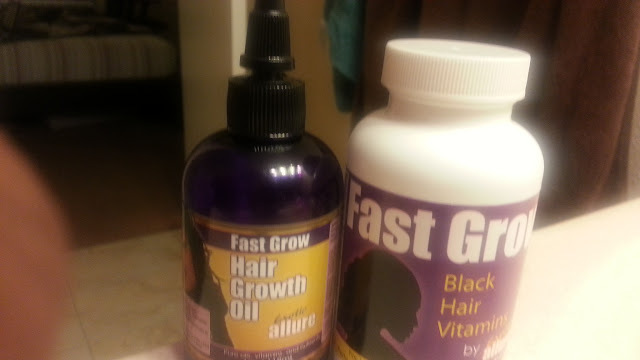 Fast Grow Black Hair Oil contains Jojoba oil, Coconut Oil, Aloe Vera, L-Cysteine, MSM, Horsetail, Chamomile, Hops extract, Lime Oil, Biotin, Pro-Vitamin E, Pro-Retinol, Pro-Vitamin D, Wild Cherry Bark and is available directly from the companies http://www.exoticallure.com/hair-growth-oil.htm. DISCLOSURE: I was given free products by Sunset Hair for the purpose of this review. All opinions are my own honest experience of the products.